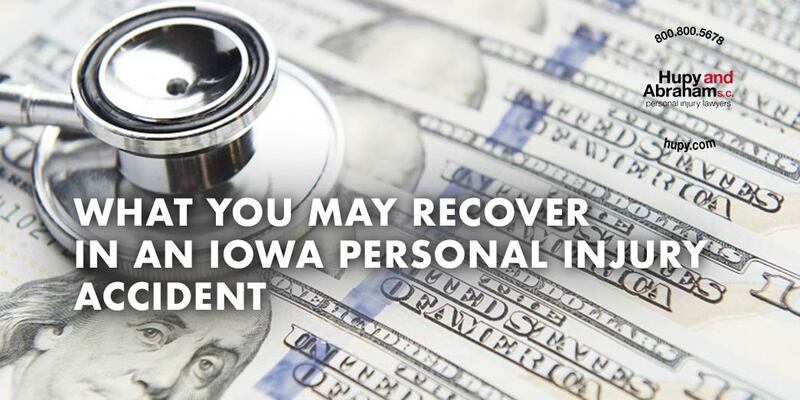 Iowa Personal Injury Damages | Hupy and Abraham, S.C. If you could, you would go back and avoid the accident that left you hurt. You would escape the physical pain, the emotional suffering, and the financial consequences that you are experiencing. Unfortunately, this is impossible. A lawsuit can’t make it as if nothing ever happened, but recovering damages is as close as you can come to being compensated for your injuries. Medical expenses. All of your healthcare costs including—but not limited to—doctors’ appointments, hospital stays, surgeries, medications, physical therapy, and other rehabilitation therapies should be compensated. Lost income. Any wages, income from self-employment, benefits, bonuses, or other income that is lost due to your injuries is compensable. This includes everything if you are unable to work at all or partial losses if you are unable to work the same hours or the same job that you did prior to your injury. Out-of-pocket costs. Any costs you incur as a direct result of your injury may be compensable. This could include things such as household help or childcare that was made necessary because of the accident. Pain and suffering. Emotional suffering and physical pain are hard to value, but they are important to include in your recovery because they can be the most significant damages that you experience. Additionally, you may be able to recover punitive damages in some personal injury cases. While punitive damages are meant to punish the defendant rather than compensate you for your injuries, the effect of punitive damages may be to put more money in your pocket. In order to get the full and fair recovery that you deserve, you need to present evidence of your damages and persuasive arguments about the value of your recovery. An experienced personal injury lawyer can help you by investigating your claim and presenting it to the court. For more information, please contact us online or call us directly at 800.800.5678 to schedule your free and confidential consultation.